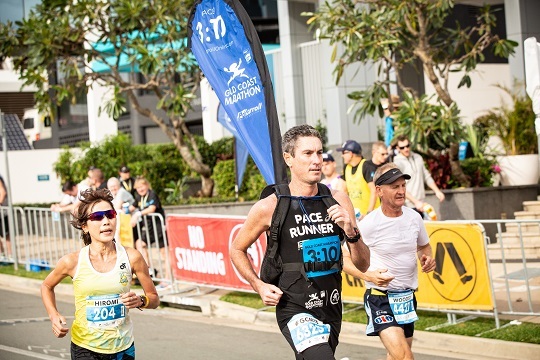 The Pat Carroll Online & Onland Pacers assist participants to their time goals in the Gold Coast Marathon, ASICS Half Marathon and Southern Cross University 10km Run. Pacers are experienced runners who aim to maintain an even pace throughout the race with the goal to have you finishing slightly faster (30 seconds or so) than your goal time. For easy visibility, the pace runners will be carrying a colored balloon and a goal time sign high amongst the starting runners. Each pace runner will also wear a singlet with the goal time marked on the back. It’s important to know the start zone your pace runner will be in and ensure you choose the same start zone when you enter so you can start the race near your pace runner. Each pace group will have at least two pace runners who will lead the pace (off net-time) whilst guiding & motivating you throughout the race. Pacers will run to the ‘Net Time’ (also called ‘Chip Time’). Net Time is the time it takes you to complete the distance once you’ve crossed the start line. Note: Due to participant numbers, it may take several minutes to cross the start line after the gun is fired. Reach your Gold Coast Marathon, ASICS Half Marathon or Southern Cross University 10km Run goal and purchase a silicon pace band for $5. Pace bands are available online to purchase at the time of registration. Or if you have already registered please purchase via the Update my Entry portal. 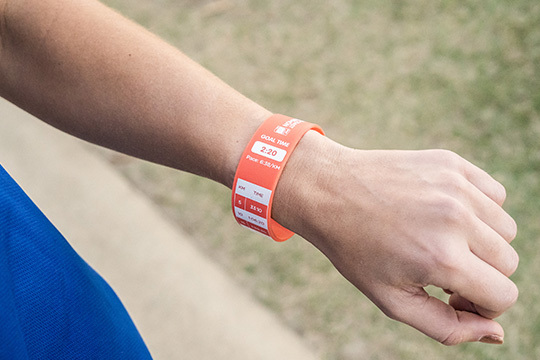 Entrants are required to collect their pace bands from the Pat Carroll Online and Onland Pace Runner Booth at the Brisbane or Gold Coast Check in Centres. Some pace bands will be available for purchase direct from the Expo. WIN! Sign up to a pace group at the booth for FREE and go in the draw to win an ASICS prize pack valued at $150. Get to know the men and women who will be pacing you to a good time in the Gold Coast Marathon, ASICS Half Marathon and Southern Cross University 10km Run. 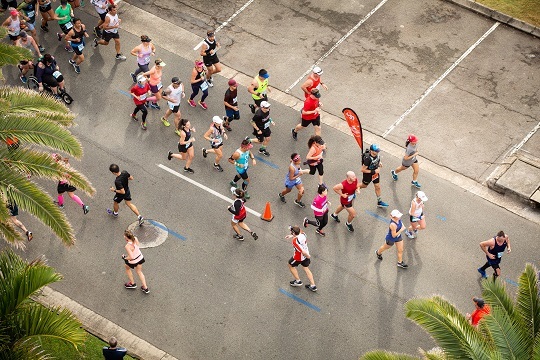 The Pat Carroll Online and Onland Pace Runners provide their tips on staying motivated and how to execute your race day plan. Pace runner profiles coming soon! Register to run in a pace group & go in the draw to win an ASICS prizepack! Why do you want to run with a pace group? Want to be a pacer in 2019? To adequately carry out the pace runner role you’ll need to be able to comfortably run the pace you’ve nominated for. You also need to be prepared to offer encouragement and motivate runners in your pack. All pace runners will receive an entry and singlet. Contact Pat Carroll for more information.